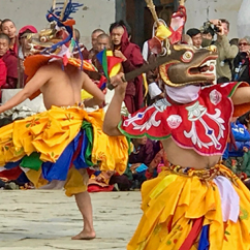 We will visit temples, including the famous Tiger’s Lair, monasteries, nunneries, dzongs (fortress), art projects, schools and Kutira’s special projects. The timing is perfect as we will have the great honor to partake on several famous dance festivals as we travel along. This will be a once in a lifetime experience that you don't want to miss. On this journey you will meet like-minded friends and explore the magical and mystical land of the Thunder Dragon and National Gross Happiness as we also get to sample delicious and diverse local cuisine from fine dining to family prepared traditional food. This is truly the last jewel of the Himalayas and if spirit is calling you, then you will be immersed in the beauty of Bhutan.